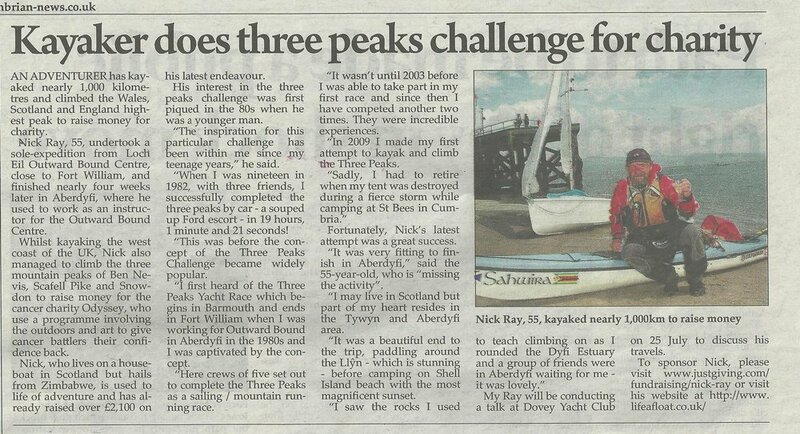 The Cambrian News described me as an adventurer when they wrote an article about my 3 Peaks by Kayak fundraising journey, (link here). It was strange for me to see myself described as such and this made me think about the concept of adventure per se and that of being an adventurer. Strangely, despite having lived my life immersed in the outdoors working as a guide and outdoor instructor, experiencing myriad incredible adventurous experiences for myself and undertaking some fairly major expeditions, I have not viewed myself specifically as an adventurer. This is a title I bestow on others who I deem more worthy of the description than me. I guess, I consider my efforts benign in comparison to what other folks have achieved. Seeing the word attributed to me in the newspaper article at first caused me to cringe a little, but then I glowed with a sense of self-recognition. I'm interested why this simple attribution is important to me. First of all, it is important because it is a form of recognition. There is a drive within every human to be positively recognised for who we are. We consciously or unconsciously live our lives in such a way so that we receive attention and acknowledgement which can only be provided by another person or people. I'm never going to be recognised for academic prowess or business acumen, so finding myself acknowledged for achieving something worthwhile in a field I'm adept at is particularly rewarding. Secondly, as I reach the later years of my life, I realise the importance of my legacy - the story or stories which will be recounted about me after I have departed this world. I don't want to pass through this existence without a worthy epitaph to mark my presence. This may seem a vain aspiration but as with being recognised for who I am in this present life, I would like there to be a memory of me having contributed meaningfully during my life. If this is as an 'adventurer', then I'll be happy with this. Ever since I stopped working for Outward Bound twenty years ago, I have struggled to define myself with any certainty. I suppose rather tongue in cheek I could confidently call myself a Jack of All Trades. I tried my hand in the Mental Health sector, trained in psychotherapy and ran a private practice for a few years, developed a form of 'wilderness therapy' and when I ceased this, a number of other minor job roles including sea kayak guiding. I wouldn't say that I was unsuccessful at any of those roles, it's just that I didn't fit them - they didn't fit me. Maybe I'm a rolling stone, unable to settle in any profession. If this is the case, then defining myself as an adventurer will be the ideal solution, for this is exactly what the specifications for this title demands - a person willing to roll as a stone, meeting and overcoming uncertainty along the way, maybe living with discomfort and undertaking arduous ventures. I have to admit there is an element of discomfort for me with the term adventurer. In this age of social media sound bytes and instant fame, there appears to me to be commodification of adventure as a means of shameless self-promotion. The outdoors becomes a playground, the environment barely given a second glance in the race for the perfect adventure photo, for example a blazing camp fire on virgin Hebridean Machar or a dune buggy roaring over pristine sands. I'm not suggesting that adventurers are disconnected from nature but it pains me when I see Nature being exploited for purely egoistic gain. Maybe I hold a naïve view that to be an adventurer who journeys through the wild and natural realms, one needs to do so with reverent mutuality, viewing Nature as an equal partner in the enterprise. Being an adventurer carries responsibility and it's role which can be a force for good. People look upon adventurers as sources for inspiration. This is one of the responsibilities I find myself accepting with serious intent. Particularly so because I have chosen to associate my endeavours with raising awareness about mental health, depression, suicide awareness and recovery. I recognise that through my profile I have a stronger voice to air my knowledge about these important subjects. Actually, this is one of the motivating factors in me deciding to follow the path of becoming an adventurer - to use this as a platform to highlight the issues surrounding depression. Of course I can only be an adventurer if I continue to embark on adventures. I don't anticipate this being an arduous arrangement to fulfil but it does come with costs and these aren't just financial. I will be required to be away from home and separated from my wife for long periods of time. This is probably the toughest aspect of adventuring for me. I feel guilt at not being home to assist with daily home life, particularly since we live on a boat and this requires some extraordinary chores like having to row Ziggy ashore for his walks. This can become an arduous chore if it is not shared. Of course separation is tough and can put strain on the marriage. I have many times wondered how early explorers managed to maintain successful marriages despite living abroad for months if not years at a time. In this day and age though, our means of communicating with loved ones is far more advanced. I am thankful and grateful that Karen supports my desire for adventures, recognising this as a positive force for my continued good health and personal growth. Being away for long periods of time also impacts life in general; missing friends, missing out on social events and negating community voluntary duties such as the RNLI Tobermory Lifeboat in my case. As with any chosen path in life, the benefits have to outweigh the negatives. It's not as if I am consigned to this role against my will, being the only opportunity within my grasp. The choice is mine and if the costs are too great then it's a simple decision to take a step back, reassessing what's important and what changes can be made. For the moment, though much of my life has been leading to this, it feels like the early stages of my embarkation along this route. It's as if I have just been offered the role and have accepted it. I'm useless at keeping an up to date blog. My best intentions to write regularly and share my thoughts with the wider world come to nought through a mixture of reasons, ranging from low self-confidence to good old fashioned procrastination. I should realise that setting myself the goal of writing regular contributions would not really work for me. I was a poor academic student who was always late with my assignments and essays, leaving writing them to the very last minute or worse, not at all. I became more adept at providing excuses than I did at writing! This said though, I do enjoy writing and I think that when I do produce a piece, it reads pretty well and I'm pleased with it. I'm not sure why I find it difficult to fulfil my aspirations to write more and I hope that when I do come to understand my blocks, there'll be no stopping me! This blog entry is by way of support for my Three Peaks by Kayak challenge which I'm undertaking this May (2018). I'm raising funds for Odyssey, a small charity who provide outdoor courses for people who have been or are being treated for cancer. I have worked for them on a number of occasions and I believe their courses to be incredibly worthwhile. It is wonderful to be writing this entry and to not be covering the theme of my depression and mental health travails. Actually, when I come to think of it, one of the reasons I haven't contributed recently, is because I was tired of only thinking of writing about my low mood, my struggles with this and the more painful truth of fighting my desire to complete suicide. I simply did not want to keep rehashing my negative thoughts and feelings and sharing these with you. It's really lovely at long last to have hope and happiness surging through my veins again. My last blog entry was about my New Year plans and I'm pleased to say that I'm at least on my way to undertaking a significant one of these. The Three Peaks by Kayak has been on my list of adventures for nearly twenty five years, really, ever since I began sea kayaking. I had an attempt at completing this in 2009 but was unsuccessful due to poor weather. 2018 will be the year that I put this adventure goal to bed and once I have, I'll feel more able to attempt other plans which have been mulling around in my mind. One question I ask myself and I have been asked this by a few other folks too, is - does undertaking these big adventures have a negative impact on the state of my mental health? Without opening up about what I struggle with when I'm in the midst of my depression, I do know that I long to be connected with wildness through some kind of outdoor adventure. Connection to wildness provides me with solace even in the darkest depths of my depression. One aspect of my adventuring lifestyle which I have come to appreciate, is how to reintegrate myself to my life at home and a more 'regular' lifestyle after long and challenging but incredibly rewarding kayaking adventure. Of course having worked as an Outward Bound Instructor and a Therapeutic Wilderness Guide for many years, I ought to understand the important process of transferring ones self from a powerful life altering outdoor experience to the normality of everyday life. I now understand how challenging this can be! The suddenness of the end of a journey can have an incredible impact and for me, and I've struggled to adapt after living a life of wild freedom and solitude. Given that I'm now paying attention to this, I'm excited to be undertaking the Three Peaks by Kayak and considering future adventures. It's a continually evolving process of self-awareness which doesn't end because I'm over fifty years old. In fact, I think that I'm learning more about myself now than I ever did in my earlier years. It's as if my life has been leading me to this - the path of the solo adventurer. Despite the risk of future depressive episodes, I have permission to challenge myself so that I continue to grow. This kayaking journey then, is as much a personal odyssey as it is a fund raising venture for Odyssey. I look forward to sharing the emerging insights I encounter on the way, as well as the everyday awe and wonder I will enjoy as I traverse the British coastline.